The College of Health & Social Sciences’ Circle of Excellence (COE) staff recognition award program is continuing for its third year. The purpose of the COE program is to honor and celebrate staff for their exceptional and unique contributions critical to the mission of our college. The COE committee consists of volunteer staff members tasked with carrying out the development, implementation and institutionalization of this program. During the nomination period, the committee will process, evaluate and make recommendations to the executive leadership of the College on the merits of each nomination. The committee will ensure award recipients are selected in an objective manner based on the content provided in the surveys in each of the award categories. 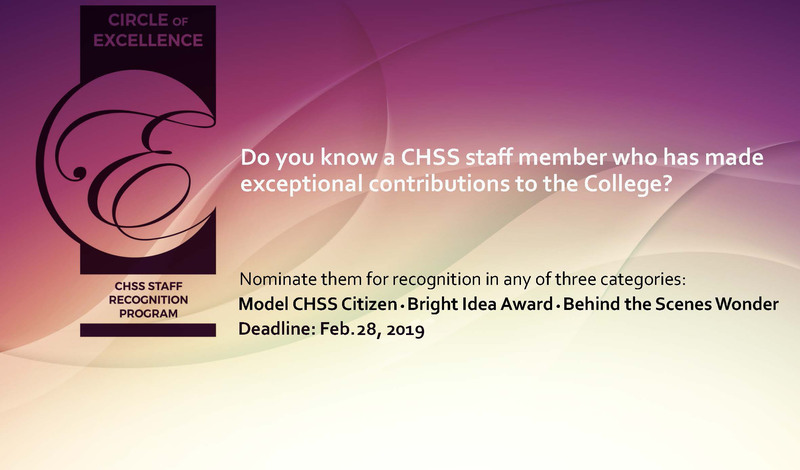 As before, the award recipients will be announced at CHSS Annual Showcase to be held on May 1, 2019. When you choose to nominate a staff member, please consider the nominee's accomplishments over the past year, or perhaps the number of years the nominee might be in a position or performing a duty that is deserving of an award. Your nomination should illustrate how your nominee's accomplishments speak to this year's CHSS Annual Showcase theme, which is: Student Success. "Focus on the donut, not the hole"
The nomination period is already underway. The deadline for nomination is February 28, 2019. If you have questions, please contact the committee at chsscoe@sfsu.edu.